Prime Minister Voreqe Bainimarama (left), in Bangkok. Fiji will lead the charge at the World Climate Summit in Paris in six months on the cost of environmental degradation. 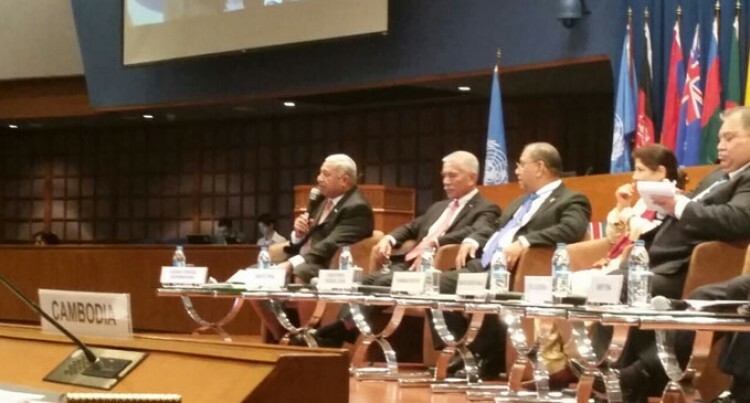 Prime Minister Voreqe Bainimarama told this to participants of a High-Level Exchange Forum in Bangkok yesterday. He said the term ‘Green Growth’ had been adopted globally to describe a path of economic growth, which used natural resources in a sustainable manner. “But it has particular resonance in the Asia Pacific region where we know that development has far too often come at the cost of environmental degradation,” he said. “The Pacific Small Island Developing States are especially vulnerable in this regard. We need to grow our economies in a sustainable manner without jeopardising our pristine environment and the futures of Pacific Islanders to come,” he added. He said his Government recognised that they needed to forge a new development model – one that was more holistic, integrated, inclusive and above all sustainable. He said Fiji’s Green Growth Framework masterplan was in place and was central to everything that they did.